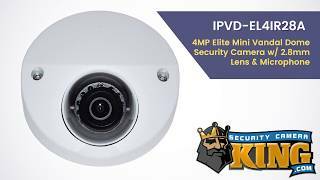 This is a great little camera here to match up with any one of our reorders that supports IP cameras. This is an ELITE series 4 MP camera that has a built in microphone. It has a 2.8mm lens which is a native “wide angle” camera. This is a very impressive camera that will give you a piece of mind for years to come. Since this is a 4 MP camera you will be able to digitally zoom in with a better result since the degradation is not as bad as it would be with a lesser camera, such as a 1 MP camera. The camera has the ability to record 4 MP at 30 FPS. This camera also has an onboard Micro SD slot, which will support up to a 128 GB Micro SD card. This is a great feature to have if you are using this as a standalone camera and do not have access to internet. 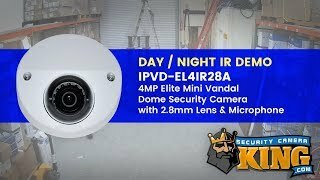 Not only does this camera look spectacular during the day, but it also looks great at night given that it has 65 feet of IR (infrared). It is very crucial to make sure a camera has IR when deciding on a camera since most crimes happen at night. It also comes with a built in microphone which is a very nice feature since you do not have to run extra wires, and you have the comfort and convenience of listening to the audio. This camera will also power via POE (power over ethernet), or via 12 volt DC. You can use this as a standalone camera or pair it with one of our NVR’s. The mobile app for this camera is supported by Android, and IOS. 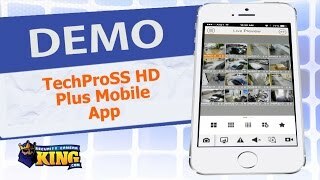 The app you will need for this camera is called “Techpro SS Lite”, and you can find this in your app store, or play store. A 2 year warranty is included with this camera, along with FREE U.S. based tech support. 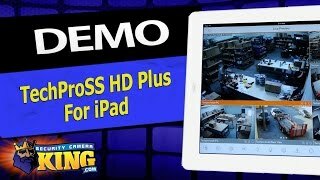 The camera was extremely easy to install using POE. I was specifically attracted to this unit as you can use it with a micro SD card for recording: ths works well with a 32GB card although you can only get a couple of days recording via this method. The resolution is superb and the field of view very wide.